Introduce students to the social science of gender. An instant best-seller and now the leading book for the course, Wade and Ferree’s Gender is a sophisticated yet accessible introduction to sociological perspectives on gender. Drawing on memorable examples mined from history, pop culture, and current events, Gender deftly moves between theoretical concepts and applications to everyday life. New discussions of #metoo, toxic masculinity, and gender politics in the Trump era help students participate in today’s conversation about gender. Wade and Ferree have made distinguished contributions to both gender scholarship and the teaching of gender. Their best-selling textbook uses accessible language and engaging examples to provide a dynamic survey of contemporary gender issues. Revised throughout to be more inclusive, the Second Edition also features a substantively revised politics chapter with new discussions of gender politics in the Trump era and the burgeoning #metoo movement. Gender quickly became the market leader for its strong sociological perspective and thoughtful organization around ideas, interactions, and institutions. Moving away from the typical textbook presentation of “theory first and facts later,” Wade and Ferree instead integrate theory throughout, moving deftly between theoretical concepts and applications to everyday life. Wade and Ferree capture students’ attention from the outset with a mix of colorful examples—and thoughtful images—pulled from everyday life, pop culture, and other disciplines. For the Second Edition, the authors have added more international examples. Each chapter begins with a thought-provoking question meant to challenge students’ preconceived notions about gender. The authors then use compelling examples and current scholarship to answer these questions, with each chapter building on the previous one to form a seamless narrative. 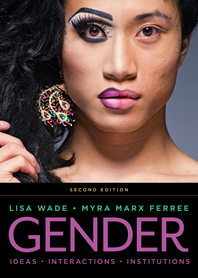 The Second Edition of Gender is supported by a wealth of materials to enliven lectures and classroom discussions. New resources include illustrated lecture PowerPoint slides, a revised test bank, a collection of streaming documentary video clips, and a new online Interactive Instructor’s Guide that includes materials written and collected by Lisa Wade. The IIG is searchable and sortable, putting all resources right at instructors’ fingertips.